Nov 13, 2014 - TORRANCE, Calif. The 2015 Honda Fit has been named a finalist for the 2015 Green Car of the Year® by the Green Car Journal. The award recognizes the environmental performance of the completely redesigned Fit, which received class-leading EPA fuel economy ratings of 33/41/36 (city/highway/combined) for the LX trim utilizing an Earth Dreams Technology™ 1.5-liter direct injection engine and Continuously Variable Transmission (CVT). Green Car Journal editors selected the Fit as a finalist based on its balance of fuel efficiency, its new space-efficient body and its highly flexible seating configurations. "With a cargo capacity near that of a mid-size SUV, the subcompact Fit is the perfect vehicle to replace larger, less fuel-efficient vehicles," said Art St. Cyr, vice president of auto operations at American Honda Motor Co., Inc. "The Fit also fulfills the Honda brand's promise to deliver both fun-to-drive enjoyment and outstanding fuel efficiency." In keeping with Honda's commitment to provide customers with both fuel efficiency and fun-to-drive character at a high level, the 2015 Fit is powered by the Earth Dreams Technology™ 1.5-liter engine paired with either a new six-speed manual transmission (6MT) or a new Continuously Variable Transmission (CVT). A combination of weight saving, friction reduction, technology application and clever engineering resulted in significant efficiency improvements while also providing an 11 percent increase in horsepower to 130, and a 7.5 percent increase in torque to 114 lb-ft versus the previous Fit's engine. A similar approach created transmissions that help provide quicker acceleration and smoother shifting, and helped the Fit receive class-leading EPA fuel-economy ratings of 29/37/32 (city/highway/combined)1 for manual transmission models, 33/41/36 for the LX trim with CVT and 32/38/35 for the EX and EX-L trims with the CVT. 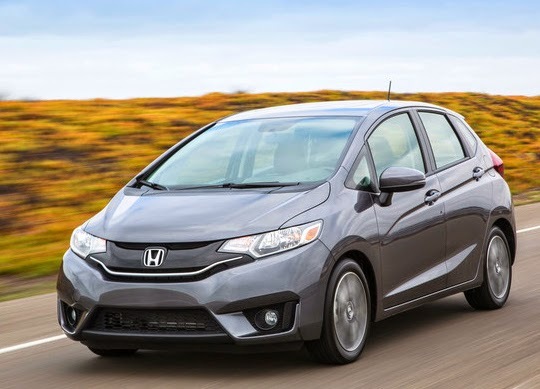 The Honda Fit has long been recognized for its practicality, fuel efficiency and affordability, together with a feature-rich and high-quality interior and outstanding driving enjoyment. For the all-new Fit, these traits were advanced to a new level with even greater versatility, fresh styling, a more dynamic and refined driving experience, and substantially upgraded technology and luxury features. "The new Fit shows once again that Honda understands the need to not only deliver desired levels of style, functionality, and performance in its new products, but enhanced environmental achievement as well," said Ron Cogan, editor and publisher of Green Car Journal and CarsofChange.com. "When you can make a model like the Fit more stylish and versatile than the one that preceded it while also providing greater power, higher mpg, and lower greenhouse gas emissions, that's an achievement deserving of recognition." As a finalist, the Fit becomes one of Green Car Journal's 'Top 5 Green Cars for 2015' and additionally earns the magazine's 'Green Car Product of Excellence' distinction. The Green Car of the Year® winner will be announced during media days at the Los Angeles Auto Show. Previous Green Car of the Year® winners include the 2014 Honda Accord line-up in 2014 and the 2012 Honda Civic Natural Gas in 2012. The GCOY award is an important part of Green Car Journal's mission to showcase environmental progress in the auto industry. Since 1992, Green Car Journal has focused on the intersection of automobiles, energy, and environment. Today, the magazine is considered the premier source of information on high fuel efficiency, low emission, advanced technology, and alternative fuel vehicles. CarsOfChange.com presents 'green car' articles online along with a focus on infotainment and connectivity. Green Car of the Year® is a registered trademark of Green Car Journal and RJ Cogan Specialty Publications Group, Inc.
Based on its vision of "Blue Skies for our Children," Honda is taking a portfolio approach to reducing the environmental impact of its products, advancing fuel efficiency, low emissions and fun-to-drive performance with new powertrain technologies from its Earth Dreams Technology™ lineup, which includes more fuel-efficient engines and transmissions and advanced electromotive technologies. Honda's alternative-fuel vehicle lineup includes the Civic Hybrid, the CR-Z hybrid sport coupe and the Accord Hybrid, the most fuel-efficient 5-passenger sedan in America, as well as the Accord Plug-In Hybrid and the Civic Natural Gas, the only natural gas-powered passenger car available from a major automaker in America. 1 2015 EPA mileage ratings. Use for comparison purposes only. Your mileage will vary depending on how you drive and maintain your vehicle.